Designs by Lisa Somerville: Got Scraps??? Make Clips! 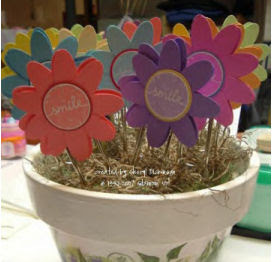 Chipboard Clips are very popular right now, there's a tutorial on SCS. My good friend Sheryl, came up with a great alternative - using Punches! These are Sheryl's clips featured to the right. Using Sheryl's idea - I gathered my punches (Large Oval, 1 3/8" Circle and 1 1/4" Circle) and scraps of my lovely Polka Dots and Petals DS paper from the Spring Mini Catalog, and got punching! I also decided to use the flower from the Office Accoutrement Set, to create another clip. What kind of clips you ask? These are the Jumbo Paper Clips, you should be able to find them at your local Target Store (they come in colors there), WalMart, Office Depot and Staples also carry them. Thanks for the inspiration Sheryl! I LOVE these flowers! I want to give it a try! 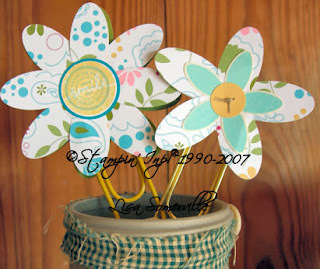 OOOH--I love the designer paper to make the flowers--great way to use the scraps too. Too stinkin' cute Lisa. Now I have to make up a batch of those little babies!!! Those would make excellent little 3D swaps!!! What hostess wouldn't like a jumbo clip????? Thanks for the inspiration. Lisa, these are so cute! Love your blog! Happy late Birthday! yours & Sheryl's turned out awesome! I have only made 2 of these so far! need to do some more!